Marawi City (Philippines): At the edge of a bridge leading into the heart of the devastation from a 2017 siege against Daesh-linked militants, an electric-blue billboard stands apart from the ruins. “Marawi will rise again! Soon …” it proudly declares in rainbow-coloured letters. The fighting was more intense; the destruction was more widespread. The Islamist forces that held Marawi had many foreign fighters among them — some from nearby countries such as Malaysia and Indonesia, and others from Yemen and Pakistan. The militants were able to persuade members of other disparate insurgent groups to rally around the ideology of Daesh. They have been driven from Marawi. But now the recovery is plagued by disorder and false starts, creating one of the region’s largest and most overlooked humanitarian crises. The reasons for Marawi’s limbo include one of the sweeping economic themes across the region: Chinese firms rolled in but stirred local opposition and questions about the long-term implications of Chinese involvement. The decision to go with Chinese proposals has been reversed after local pressure. But it was widely seen as another snub against Washington, a longtime ally of the Philippines whose counterterrorism training helped defeat the Daesh-linked militants in Marawi. It also further exposed the risks of Duterte’s strategy in cosying up to China over long-standing ties with the United States. It’s not just geopolitics at play. The crushingly slow pace of recovery has Philippine security officials on edge. The Marawi limbo has fuelled resentment, stoked rumours of conspiracies and potentially strengthened recruitment for pro-Daesh militants and others — raising the spectre of more violence to come. Banlaoi, who works closely with the Philippine intelligence service, says that at least 44 foreign fighters continue to operate in the area, documented by the Philippine army. On January 24, the Philippine army said it clashed with Daesh-inspired fighters in the province of Lanao del Sur, where Marawi is, and killed three militants. All around her in the temporary shelter where she lives, Aishah Riga, 44, hears the gossip on militant recruitment. Their pitch, she says, is that the Philippine army, along with foreign allies, destroyed Marawi and have now stalled the rebuilding. It is a conspiracy theory, but it gains traction as Marawi remains a ravaged ghost town. “If people joined, it would be because they are so frustrated with the government,” said Riga, who lives in a temporary shelter. 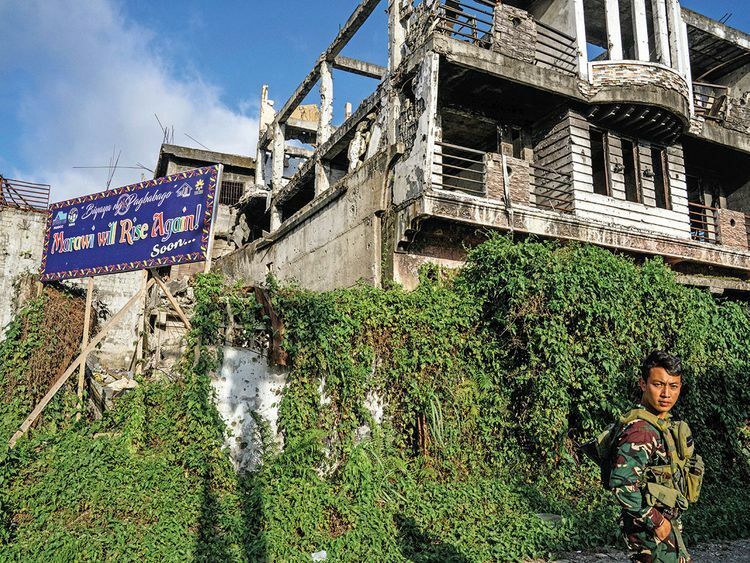 Marawi’s trouble-plagued reconstruction was rocky from the beginning. Local leaders and many Marawi residents balked at the idea of a Chinese-led consortium rebuilding the city. The unease is a combination of anger at the Chinese for crackdowns on its Muslim minority, known as the Uighurs, and a general mistrust of Chinese intentions. Across Asia, many countries have had buyers’ remorse, including being saddled with debt and losing control of key facilities such as ports. Two companies in the Marawi consortium, China State Construction Engineering Corp., China’s largest building contractor, and China Geo-Engineering Corp., had their own problems. They were blacklisted by the World Bank in 2009 for corrupt practices in the Philippines and barred from the bank’s project for six and five years, respectively. Last June, this consortium was disqualified for failing to come up with funding for the Marawi project. A government task force then entered negotiations with Power Construction Corp. of China, or PowerChina, which entered into a joint venture late last year with Philippine construction company Finmat International Resources. “With PowerChina, we started again from zero,” said Felix Castro, field manager of the Marawi task force. The groundbreaking ceremony for the rehabilitation finally began October 30. But Philippine officials again changed their approach, telling The Washington Post that PowerChina is no longer involved. The Philippine company, Finmat, has also been ordered to stop work clearing debris after it demolished at least 56 buildings without the consent of homeowners. When The Post visited “ground zero” of the siege this month, no construction or debris clearing was ongoing. Bright-orange trucks and construction equipment were parked in a field. Finmat is now pursuing legal action against the Philippine government for wrongful termination of its contract, people familiar with the matter say, speaking on the condition of anonymity as they were not authorised to speak publicly on this issue. Officials from both companies did not respond to requests for comment. Amid the tussle, local leaders are doubtful that the government can keep to their timeline of having the displaced return home by the end of 2021 — before Duterte’s presidential term ends in 2022. “[They say] in 2022, Marawi is a new home. The question is, it’s already 2019. Your plan was supposed to start in mid-2018. And your timeline was supposed to start in 2018,” said Fayka Adiong, the chairman of a district in Marawi who also serves as the spokeswoman for the Let Me Go Home movement, which advocates for those who want to return to the city. As the Chinese companies were falling out of favour, the United States in October committed $25 million (Dh91.81 million) to those affected by the siege. Through the US Agency for International Development, or USAID, Washington has committed almost $60 million so far to education programs and relief in Marawi. “There’s a worry that geopolitical interests are pushing the development in one way or another,” Sultan Atar said. Even so, there’s a sense that the bulk of the international money for Marawi reconstruction — a total of $675 million in aid and loans, including $21 million from China — has not flowed down to the most vulnerable. Scattered across the towns and cities outside Marawi are dozens of shelters and evacuation camps. They range from concrete structures with electricity and bathrooms — where Riga lives — to chaotic tent cities. Many more live in overcrowded homes of relatives and friends, too ashamed to go from their former middle-class lives as traders and shopkeepers to government-controlled shelters. Among the worst of the shelters is an encampment set up under a town hall’s covered basketball court. There, Riga’s eldest son lives in a shack no bigger than a large table with his wife and five children. They built their shelter out of wooden particle boards, cardboard and tarp, erecting knee-high barriers and makeshift doors so stray dogs don’t venture in at night. “We hear of so many millions and millions and millions of aid given ... but nothing has happened,” said Riga, whose family includes nine children and six grandchildren. Banlaoi, the terrorism researcher, believes these camps, which have barely any security, are “breeding grounds” for extremist recruitment, from rank-and-file members to future leaders. “The situation [creates] a feeling of discontent, disempowerment, disappointment ... hopelessness, that [makes] those people vulnerable to recruitment,” he said. Another potential flash point came in January with a landmark referendum aimed at giving expanded autonomy to the predominantly Muslim region. The Duterte-backed referendum would establish a new autonomous administration in Mindanao — first through a transitional authority, before eventually having its own parliament. The referendum passed overwhelmingly in key areas including Marawi, seen as the first step toward ending decades of violence in the region. But the referendum has never been backed by groups like Abu Sayyaf and the Daesh-linked Maute group, and analysts warn that the autonomous region will remain under threat of violence. On January 27, just days after vote, twin bomb blasts at a cathedral in Jolo, the capital of Sulu province, killed 20 and wounded at least 81 others. The bombs were timed for the start of morning Mass, and the second was detonated just as soldiers were rushing in to respond. No group has claimed responsibility, but Philippine terrorism experts said it bore the hallmarks of an Abu Sayyaf attack. Across “ground zero” in Marawi, homeowners have scribbled their family names and phone numbers, graffiti-like, on the walls that remain of their former homes — an attempt to lay claim on the land that they once lived on. Marawi residents are unnerved that they can’t return home to so much as see their homes except for a brief three-day trip last April, fearing that all this while, developers and the government have been plotting to redevelop their land without their input. “The healing process won’t start until such a time that the people can visit the place of their suffering. The cause of their suffering is the loss of their homes,” said Acram Latiph, executive director of the Marawi State University Institute for Peace and Development. Riga holds on to the memory of her short visit back to the modest two-story concrete building she still calls home. She brought a cookpot along with her, desperate to have dinner with her family there — never mind the hollow rooms, stripped of all possessions, and mounds of rubble littering the floor. “It was like living at home again. We were so happy,” said Riga, tearing up at the memory as she sits on an inch-thin mattress in her temporary shelter.